A couple of years ago I heard of an older couple that were moving into a care home. The children were selling some of their belongings, one of which was a desk. I was in dire need of a work desk, so I went out to take a look. The address turned out to be a little mobile home upturned with boxes of belongings and worn furniture stacked so high you could barely turn around. I was struck by how sad it must be to have to pack your life up like that. On the other hand maybe they were quite satisfied with the arrangement and looked forward to their new home with eager anticipation. I do tend to fantasize. At any rate, I liked the desk..I especially liked the roll top feature. I could leave a mess behind and just pull the top down on it and have the room itself look neat and tidy. Very cool. They need to put this feature on more items. Beds and kitchen counter tops come to mind. I brought the desk home and as I was cleaning it out I noticed the tiniest slip of paper wedged into the seam of one of the drawers. I was very curious and slid it out with my nail. It was a hand drawn pattern for what looked to be either a quilt piece or maybe a little doll boot. 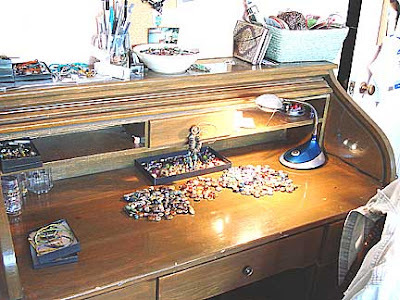 A hard working crafter had owned this desk! I put the little slip of hand drawn pattern for who knows what back into the drawer and there it will remain with all of my own accumulating creative designs. I’m sure it’s what keeps the muse flowing around that work desk. That and my lucky purple socks. >How wonderful – I adore finding things like that! 🙂 And what a spendid desk. >What a wonderful find!And yes, a roll-top feature for my laundry pile would be fabulous…. « >From the kiln today..
You are currently reading >My Work Desk at fireandglass.